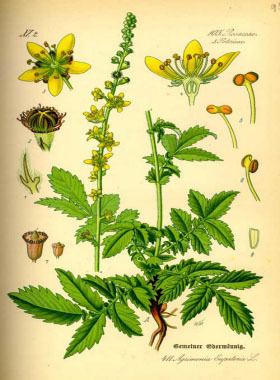 The name agrimony comes from the Greek Argemone, which means a plant that is healing to the eyes, although Agrimony isn't often used in this capacity. Eupetoria is a reference to a king who died in 63 BC and was renowned for his herbal skill and knowledge. It is also called church steeples for how the flower spikes stand up straight and tall. Agrimony is also known as cockleburr and sticklewort for the burrs on the fruit. This member of the Rosaceae family (rose family) is used in traditional medicine to treat inflammatory and oxidative related diseases. Aerial parts of the plant are used to make teas, infusions, bath bags, mouthwash and topical preparations. Distinguishing Features: This medium to tall, erect perennial plant has deeply veined pinnate leaves and is easily recognized by its conspicuous spike of five petalled yellow flowers throughout the summer. Each flower develops into a distinctive reddish-brown woody fruit, deeply furrowed and fringed with hooked bristles. Flowers: The corolla is regular, yellow, and is about 10 mm (0.4”) broad. 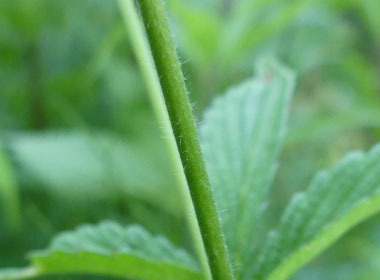 The flower has five petals that are usually round-tipped, and 4 to 5 mm (0.16–0.2”) long. The calyx is 5-lobed, it has 10 to 12 stamens and 2 pistils. Flowers occur as an inflorescence (a long spike), and the flowers are fragrant. Flowers bloom throughout the summer months. 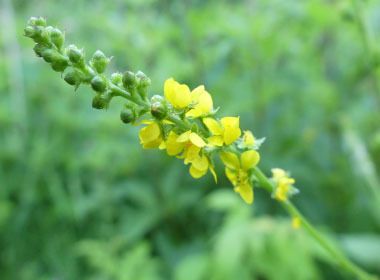 Fields of Nutrition has medicinal benefits and vitamin/mineral content of Common Agrimony. Leaves: Young leaves grow in a basal rosette. As the plant matures they occur alternate on the stem, stalked, and stipulate. 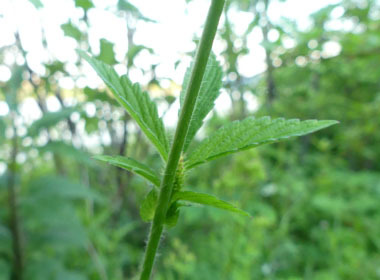 Stem leaves are smaller than rosette leaves; the upper part of stem leaves are shorter than the internodes. 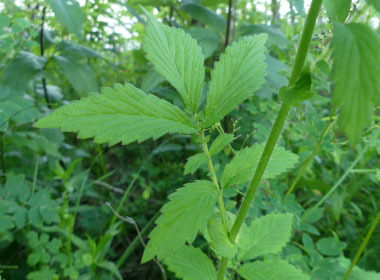 Leaf blade is pinnate, 3 to 6-paired, with a terminal leaflet Leaflets are elliptic–lanceolate, large-toothed, the underside is densely haired, with glandular hairs and somewhat greyish. Between leaflets small leaflets intermixed with large ones. Height: Can grow anywhere from 30cm to 1 metre in height. (12 to 40”.) Stems are upright and hairy. 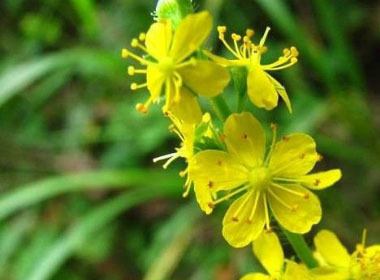 Habitat: Agrimony grows in many areas including dryish meadows, forest margins, pastures, and river banks. This wild plant can tolerate a wide range of base-rich to neutral soils but does best in a well drained location. Edible parts: A tea is made from fresh or dried leaves, flowers and stems. It can be consumed hot or cold. Seeds can be dried and ground into a meal.